Courtesy Double Helix Games we've got a host of new details on the upcoming Killer Instinct reboot/sequel/whatever it is. During Monday's Microsoft press conference, the tech giant wheeled out Killer Instinct to the delight of many fans. Unfortunately, we only saw maybe a minute or two of actual gameplay, and learned very little about the game from that time. Fortunately, the Killer Instinct fans at the Rare FanDaBase grilled developer Double Helix Games and came away with far more interesting info than any of us drew from Microsoft's presentation. Let's start with the game's roster. It had already been established that Jago, Glacius and Sabrewulf would reappear in Killer Instinct but Double Helix claims that Fulgore, Spinal and Cinder will also be among the game's cast of brawlers. Presumably there are more classic Killer Instinct faces yet to be revealed, but Double Helix also states that the game will include an as-yet-unknown number of new fighters. Development-wise, Killer Instinct was always intended to be an Xbox One title and has been developed from the ground up with that intention in mind. It's currently slated to appear as an Xbox One launch title, and while the game will bear the dreaded "free-to-play" badge, Double Helix plans to offer a number of payment (or non-payment) packages for players to choose from. While Killer Instinct seems an attempt to harken back to the halcyon days of the 1990s, it will include some pretty major functionality changes. Double Helix has removed No Mercy and Ultimate Combo attacks from the game, saying that they are unnecessary. For those of you not in the know, these are more or less the Killer Instinct version of Mortal Kombat's fatalities. Further, it's also apparently possible to start an Ultra Combo, cancel into something else, then cancel back into the Ultra Combo. This is supposed to be really spectacular, but Double Helix's spokespeople say that they've never seen anyone actually accomplish this feat. 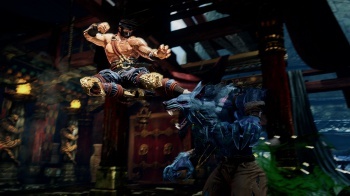 Double Helix also claims that the game's combo system has been streamlined, so that while Killer Instinct will supposedly be a mix of gameplay concepts from the original Killer Instinct and Killer Instinct 2/Gold, players hoping to pull off ridiculous 20-plus hit combos should have an easier time doing so. I'll reserve judgement on all of this until I've actually spent some time with Killer Instinct, but everything from that "free-to-play" bit down makes it sound like Double Helix is creating a more player-friendly Killer Instinct. Of course, I'm being diplomatic, and if you'd prefer the term "watered down" I could see that argument being made. Fans? What say you? Any of this upset you?